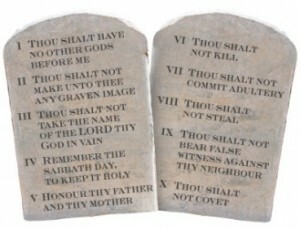 OKLAHOMA CITY, Okla. — A committee of the Oklahoma House of Representatives has advanced a bill that would allow for the display of the Ten Commandments in public buildings and on the grounds of such facilities. H.B. 2177, introduced by Rep. John Bennett, R-Sallisaw, passed the House General Government, Oversight and Accountability nearly unanimously with a vote of 7-1 on Thursday. It recognizes the impact of certain documents on American history. The bill also authorizes the attorney general’s office to defend the constitutionality of the display should it be challenged in court. Other religions, such as Islam or Satanism, would not be included because they did not play a role in the founding of the nation. The move appears to serve as a means to restore the Ten Commandments to the state capitol after it was removed in October 2015 following a ruling from the Oklahoma Supreme Court. As previously reported, the American Civil Liberties Union (ACLU) of Oklahoma was at the helm of the legal effort to have the monument removed, as it asserted that the placement of the Decalogue on the grounds of the state capitol building was unconstitutional.